I’m not a big fan of spiral bound notebooks or notepads. Spiral binding will usually put me off buying a notepad, but in the case of the spiral bound, Chinese made nu: tough paper I couldn’t resist. I saw this notebook in the supermarket run by my employer’s /my university’s students’ union and the words “paper made from stone” managed to grab my interest at first sight. In case you wonder, the Kaweco was filled with non erasable ink from Diamine. How does the paper behave? Compared to normal paper the pencil line left on this ‘stone paper’ feels much darker . The line also feels wider. Applying less pressure when writing will also produce a fairly dark line, more so than writing with less pressure on normal paper. I suspect this behaviour is caused by a rougher paper surface. You can certainly feel more friction when moving a finger across the ‘stone paper’, compared to normal paper. How does the ‘stone paper’ compare to similar products? The lines left on this paper are also darker than those a pencil would leave on paper from a Rite in the Rain notepad. Altogether, this paper produces an unusual, but pleasant pencil writing experience. the moment your fountain pen is a wet writer, even if only to a very small degree, the ink will take a really long time to dry. On the above image you can see text written by a Kaweco Sport with an EF nib. The cartridge was empty and the pen was therefore an extremely dry writer. Drying took a few seconds. The lines made by the Pentel Tradio on the other hand, not a wet writer when I compare it to some of my other fountain pens, took just under 10 minutes to dry. On normal paper the Tradio‘s lines only take a few seconds to dry. How strong it the paper? The paper seems to cope better with ‘bad conditions’, like wetness and physical impact. When trying the tear it nu:’s tough paper does behave rather unusual. Unlike the Rite in the Rain paper, which provides a similar ripping experience to traditional paper, ripping the tough paper feels a bit like ripping thin sheets of plastic. This is probably cause by the HDPE content. Normal paper usually rips in such a way that a sheet of paper lying horizontally will not be separated by a clear vertical line. Where the traditional paper is separated one half of the torn paper might contain more of the top layer of the paper, while the other half of the paper might contain more of the bottom layer of the torn paper. The tough paper however seems to stretch a bit where you tear, then separate clearly, while the stretched part curls slightly. It feels rather plasticy. Altogether a nice notepad. It’s an interesting novelty and I’m sure I’ll enjoy using it, but I’m not sure I’ll buy more once the novelty effect has worn off. I paid £2.50 for this notepad. It’s spiral bound, has a tough cover and back, and has 160 sheets of paper. In 2013 Wired published an interesting article about ‘stone paper’. I bought the Pentel Tradio in 2013 at Müller Markt in Volkach. As far as I remember it was extremely cheap (<€10). Thank you for that detailed review. Can you compare the paper in this pad to the one in the Ogami Stone notebook? Their recipe seems to be very similar. (I have tested the Ogami notebook and was disappointed). Gunther, thanks for your comment. I have read about the Ogami notebook in Wired’s article, but I have never seen it in real life. Do you like using the paper in the Ogami notebook? 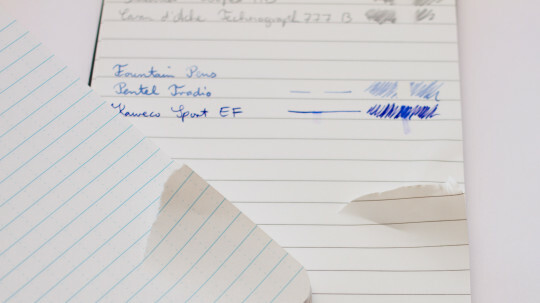 With regard to wet writing with Fountain Pens and long ink drying times (on any paper but especially this one), does anybody in the fountain pen world use blotting paper these days? At school we always had a sheet of blotting paper in our exercise books to ensure we could close them without waiting for them to dry and it never smudged the writing. Gunther, selling waste from quarries – that’s a funny way of putting it 8^) My guess would be that the Ogami paper must be quite different to the Tough Paper. To me it didn’t feel as if pencils stuck to it. I wouldn’t be surprised if the Ogami paper will still sell – it might be acceptable when used with ball point pens. I always have a small piece of blotting paper in the cover of my Hobonicho Techo because on the Tomoe River paper the ink needs quite some time to dry. 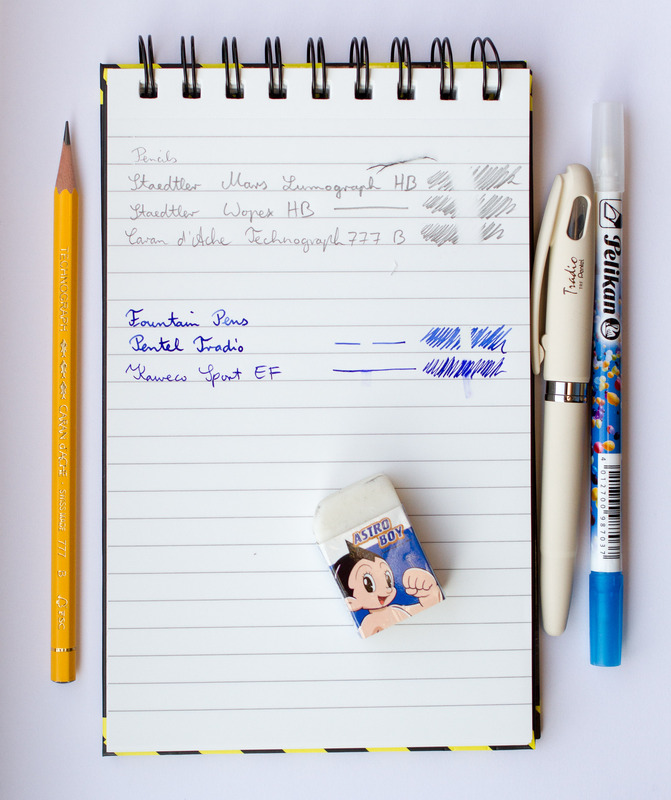 But there is an alternative to blotting paper, namely a waterproof ink. I was lucky to get a sample of the waterproof ink made for the Super5 fountain pen and found out that it dries considerably faster, even on the Tomoe River paper. “Tradie” (the sub branding on the right of the pad) is, I think, an Australian slang term (for Tradesman) – the pad may have had a long journey to the shop! I quite like the idea of a weather resistant pad for carrying on my bike – it would need to be A6 or smaller though, I think. Gunther, the waterproof ink sounds more than interesting. I like the idea of waterproof ink, so I like to use irongall ink (unfortunately there are fewer and fewre of those on the market) and have a modest but nice selection of Noodler’s inks, but they come with their own problems (they often penetrate the paper, feather, or need longer to dry). Thanks for information regarding the Super5 ink. I’ll look for them next time I’m in Germany. John, nu:’s website makes it sound as if they’re based in the UK and Hong Kong, but I haven’t really looked into that. I think these pads are made for the UK market. 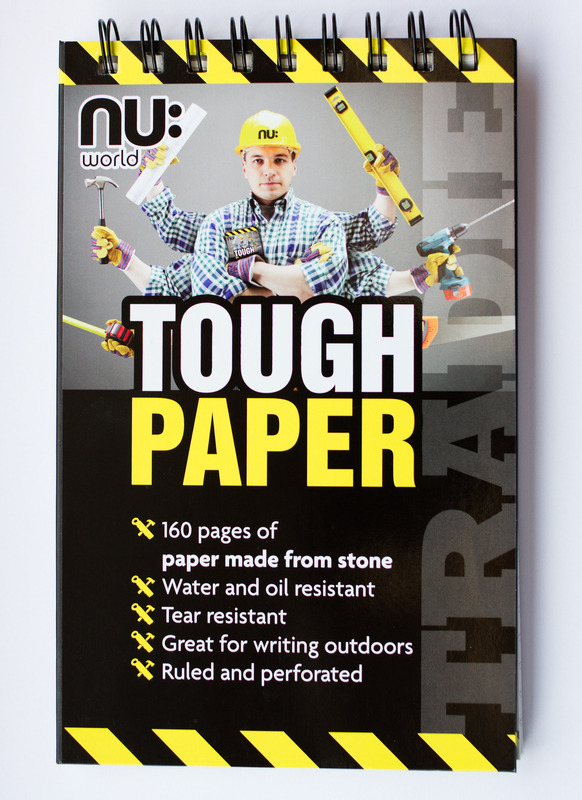 As far as I know there are several sizes of the Tough Paper available, including A7, but the Students’ Union supermarket where I bought mine doesn’t stock that size. I know almost nothing about inks but I am very pleased by the Super5 ink. I have learned that waterproof ink makes special demands on the ink feeding system and may not work in every fountain pen. – I have tried the Super5 ink on a variety of paper and haven’t noticed any of the problems you have mentioned. By the way, this ink is produced by Rohrer & Klingner and will be available in six colours. I think the problems I have mentioned are unique to Noodler’s, but go hand in hand with the inks anti-forge properties are are currently probably unavoidable. R&K make nice inks. I have used their iron gall inks for many years and like them, despite their unusual smell. I haven’t tried their non iron gall inks yet.